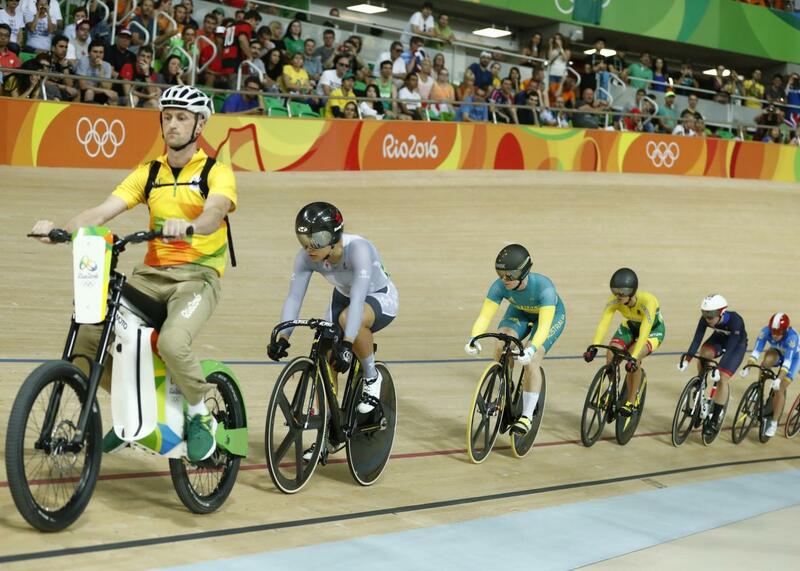 Best jobs at the Olympics: track-cycling electric bike guy. The track-cycling electric-bike guy leads the women’s keirin track cycling event at the Olympics in Rio de Janeiro on Aug. 13, 2016. Where to find him: Olympic Velodrome. Job requirements: Set the pace for the first five-and-a-half laps of the keirin race. Be unflappable. Do not fall off your electric bike. Why this might be the best job at the Olympics: You have a very important role. You set the pace for the cyclists competing in the keirin race. You will ride an electric bike around and around the track, gradually increasing your speed with each lap, and the cyclists will follow you, obediently, like rats being lured out of Hamelin. You are the Pied Piper of cycling, except your flute is an electric bike. As the track-cycling electric-bike guy, you will get to ride an electric bike. Your bike is known as a derny, which is an excellent name. You will get to ride it at speeds of up to 30 miles per hour, which is fast, but not too fast. Do you have a “need for [moderate] speed”? Is helmeted electric-bike–borne forbearance the condition for which your soul yearns? Then you will truly enjoy the job of track-cycling electric-bike guy. You will run the show as the track-cycling electric-bike guy. You will establish the speed for the initial keirin laps, and the racers will not exceed it. As the track-cycling electric-bike guy, no one will ever pass you up on the track. You are like the protagonist of the song “Leader of the Pack,” except that, unlike your fictional counterpart, you will not die prematurely after riding too fast in inclement weather. You get to live! And live well! You will become a minor celebrity. Journalists will write human-interest stories about you and your interesting job. The Shangri-Las will record a song about you, titled “Leader of the Pack (for Five-and-a-Half Laps).” You will develop a small but devoted cadre of fans who will follow you from race to race. “There he is, our hero, the track-cycling electric-bike guy,” they will scream when you come into view. “Let’s get his face tattooed on our necks!” You will inspire many interesting body modifications as the track-cycling electric-bike guy. Track-cycling electric-bike guy is a job for all ages! You can do it even if you are very old. You do not need to be extremely fit or athletic to succeed in this job, because the derny does most of the work. You could probably customize your derny if you wanted. If you painted your name on your derny, and you also painted some flames on there, and you also put your name and some flames on your helmet, there is a decent chance you could still keep your job as the track-cycling electric-bike guy. Why this might not be the best job at the Olympics: You will never cross the finish line as the track-cycling electric-bike guy. You will be forced to stop riding after five-and-a-half laps, every single time. You will watch mournfully as the top competitors complete the race and experience the thrills of victory, thrills you will never know. Your friends will plead to borrow your derny. “Can we borrow your derny?” they’ll say. “You only need it for five-and-a-half laps.” If you decline, they will resent you. If you accede, you will stay up nights worrying that they will crash. If your derny gets in any kind of accident, you will no longer be the track-cycling electric-bike guy, even if that derny accident was not your fault. You will end up in a lot of no-win situations as the track-cycling electric-bike guy. 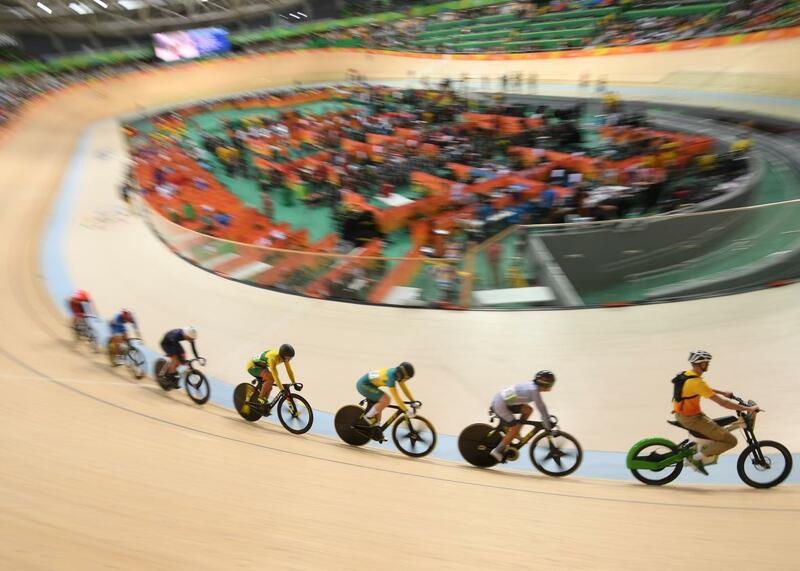 The track-cycling electric bike guy leads the women’s keirin second round track cycling event during the Rio 2016 Olympic Games in Rio de Janeiro on August 13, 2016. You will worry that a renegade bicycle will one day usurp your authority and pass you on the track, exceeding the pace that you have so carefully set. You will compensate for these fears by affecting a brusque, authoritarian manner in the locker room. You will drive away those closest to you. You will end up friendless and alone, although you will have an electric bike, one that you have perhaps customized with your name and an intricate pattern of flames. You will feel great pressure to join an electric-bike gang, and to wear that gang’s colors during the performance of your duties, thus attracting the attention of the law. You will fall in with gamblers who will urge you to somehow “put the fix in.” As a track-cycling electric-bike guy, you will be at constant risk of losing your soul. The neck tattoos that you inspire may well be unflattering. How this could be a better job at the Olympics: The derny could have a little sidecar for the track-cycling electric-bike guy’s funny sidekick. Verdict: I’ll give the job of track-cycling electric-bike guy 2.5 out of 3 points for exposure, because if you’re watching the keirin races, then you’re watching the track-cycling electric-bike guy for exactly five-and-a-half laps. 2 out of 3 for enjoyment, because this job doesn’t afford many opportunities to terrify pedestrians by revving your engine at stoplights; I imagine the electric bike purrs very quietly. 3 out of 3 for enviability, because, just to reiterate, this job involves riding an electric bike. And 0.5 out of 1 in the category of “Do you get to wear a cool hat?”, because while a helmet is considered to be a hat in many cultures, I’m not sure if it counts as a cool one. 8 out of 10 for the track-cycling electric bike guy. This is currently the best job at the Olympics.